Live mannequin maybe a thing of the past but Maria Sharapova still pull the crowd by posing in the window of a luxury department store in London, Liberty. Perhaps she's on the phone with Charlie Ebersol... or Dad. Wearing a white V-necked jumpsuit and a pair of brown high heels at the central London store, the former Wimbledon champion met and chatted with the winning students of London College of Fashion. The winner shakes hand with the tennis fashionista. 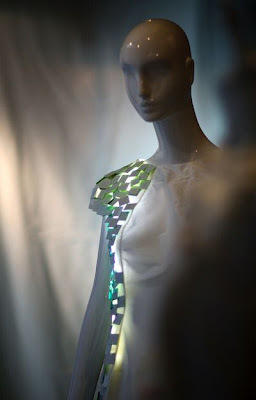 The winning 'blinking' dress. Chic and sweet! The Asian girl is probably intimidated by Sharapova. Coming back to tennis, the Wimbledon seedings were announced yesterday and Sharapova who is currently ranked at no. 59 is in the 24th seeded position.